This bridal picture was sent to me by Lynne Ayers. Helen was her great aunt. In the picture of the four Douglass sisters, Helen is the youngest sister in that photo. I do not know the exact wedding date but I am guessing it was after 1910 because her husband, Malcolm Oswald, was living at the St. James Club in Montreal in 1910 according to the Montreal directory. Malcolm was the son of William R. Oswald, one of the petitioners for certification of the Montreal stock exchange. The family was obviously affluent and well-known in the city. I suspect that Helen met Malcolm through her nephew, Sydney Grafton, who as a young man worked for the Oswald firm in investment and insurance. It must have been a lovely wedding. 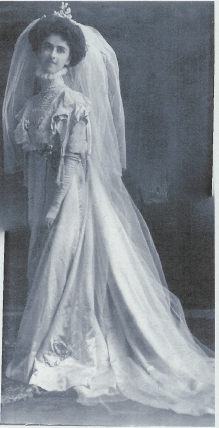 Years later Helen’s wedding gown was donated and is in the Dundas Historical Society Museum in Dundas, ON. Helen’s father was Dr. Robert Douglass about whom I told a story in my book, Only a Week Away. Another great picture from Lynne. This one is of the Grafton and Oswald cousins. This was a great help to me in estimating when Douglass Oswald, Helen’s son, was born. I wrote of some of my efforts to learn more about him in the September 2006 issue of the Douglass Digest. The girls are Yolanda and Audrey Grafton, whom I discovered in the 1937 Montreal directory. I was surprised to find them because another Grafton researcher did not think Sydney had any children. He was wrong. The young man in the front is also named Sydney, after his father. 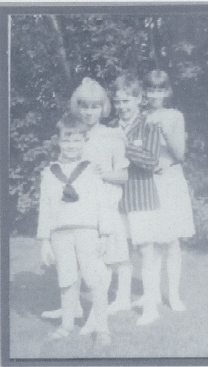 It seems I neglected to tell you that Audrey, Yolande and Sydney had a brother, Ian, the youngest, born about 1923.